Do your pitchers look terrific when they’re up-close warming up, only to struggle once they move back to the rubber? If so, then Up-Backs are just what your pitchers need. Up-Backs are a terrific pitching drill that will help any level pitcher quickly solve any pitching problem. Check it out! Being closer makes things much easier for pitchers. Whether it’s closer by a little, or closer by a lot, just the fact that a pitcher is not standing on what they often feel is the rubber of doom, can make a big difference. But when they move back, things can go haywire. They tense up, get frustrated and ultimately get worse. If this sounds familiar, then I’ve got a workout that will help your pitchers blend in both distances to ultimately make them much better from the pitching rubber. Here’s the super effective method I’ve found to help pitchers take whatever they might be struggling with, and figure out a solution – fast! Have her pitch 3-4 pitches from the UP position until she can start to feel what she’s doing. Now move her BACK to the pitching rubber and have her pitch 1-2 pitches from this distance. Chances are they aren’t as good and the pitcher gets a little frustrated. Now, move her UP to the closer position and have her pitch 1-2 from this distance. Ask her to feel what she’s doing better up here so she can drag it BACK with her. 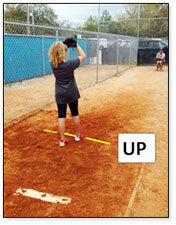 Now move BACK to the pitching rubber and see if she can throw 1-2 pitches like she did closer up. 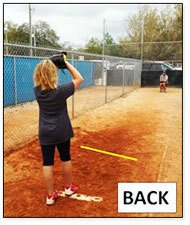 These UP-BACKS will work for any fundamental your pitcher might be working on, as well as any advanced type of pitch. It’s a great way to help your pitchers calmly and quickly figure out a solution by putting them into the position (or in this case, distance) where they CAN do that thing correctly…and then simply have them bring it BACK with them to the pitching rubber. If you’re a VAULT CLASSIC member then these 2 eClinics are already in your account – start watching them here! I use the term ” touch and feel ” for the up position to emphasize what she is trying to accomplish from that short distance.